The opportunity for the agriculture sector to increase farm gate revenues from the sale of carbon offset credits has been explored since Canada ratified the Kyoto protocol in 2002. Despite much discussion over successive federal governments, no regulatory framework exists for the development of a Canadian carbon market. However, numerous regional markets have been developed and carbon offset credits from viable projects are traded on a regular basis. The Province of Alberta has implemented greenhouse gas emission reduction legislation, making it the only regulated region in Canada. Despite the lack of a regulatory compliance based carbon market, numerous science based greenhouse gas quantification protocols have been developed for the Canadian agricultural sector. These tools make it possible to determine how many carbon offset credits a farm might generate from a change in management practice or through the adoption of green technologies. The economic return from carbon offset sales can then be factored into the cost‐benefit analysis for emission reduction projects. 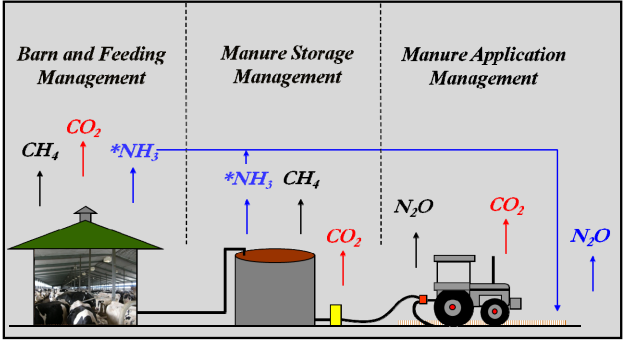 Opportunities for the Maritime livestock sector to generate carbon offsets were explored by completing a series of on‐farm greenhouse gas audits. Greenhouse gas reductions that could be achieved with advanced feeding and manure systems management in the beef, dairy and pork sectors were considered. Energy efficiency and renewable energy generation opportunities for the agriculture sector were also considered.